A complete shaving kit with everything you need for smooth, hair-free skin. Maintaining your bikini line and keeping your legs and armpits velvet-soft and free of fuzz all day long has never been easier. Comes with 4 attachments and 11 shaving stencils. Order over the phone: Call 1-437-887-1456 and quote code 53577. Use the main trimmer to shave and trim hair in the pubic area or other sensitive spots. If you need to target smaller, harder-to-reach spots, simply attach the precision trimmer - easy! 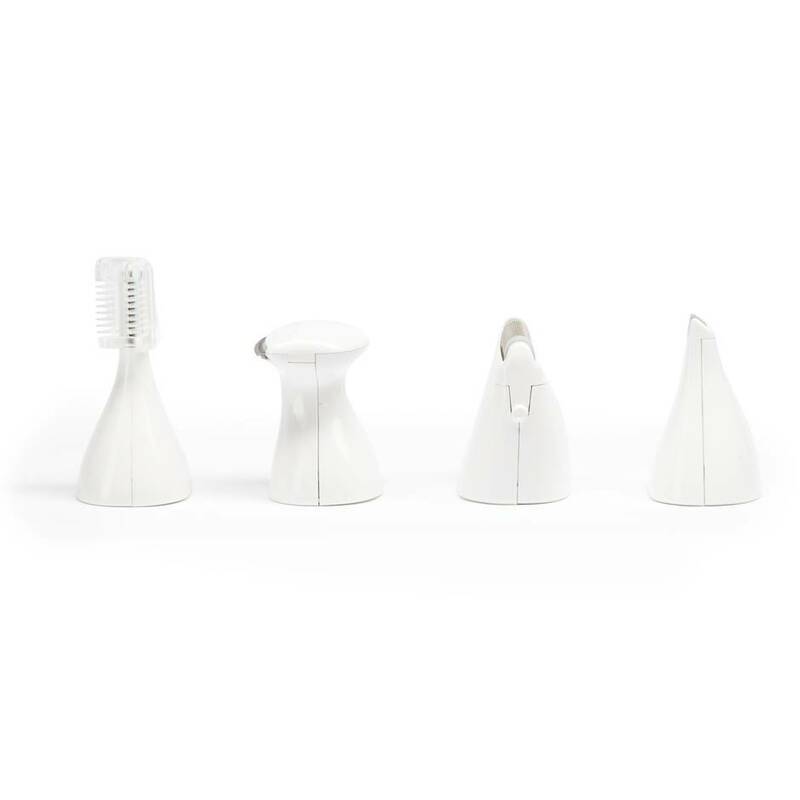 The finishing head is ideal for using on your legs for a smooth, close shave. Fancy something a little different? Why not use one of the 11 stencils to shave a design wherever you choose? Choose from a heart, cherries, arrow, 7 pointed leaf, peace sign, swan, butterfly, music note, rabbit, star or flower. 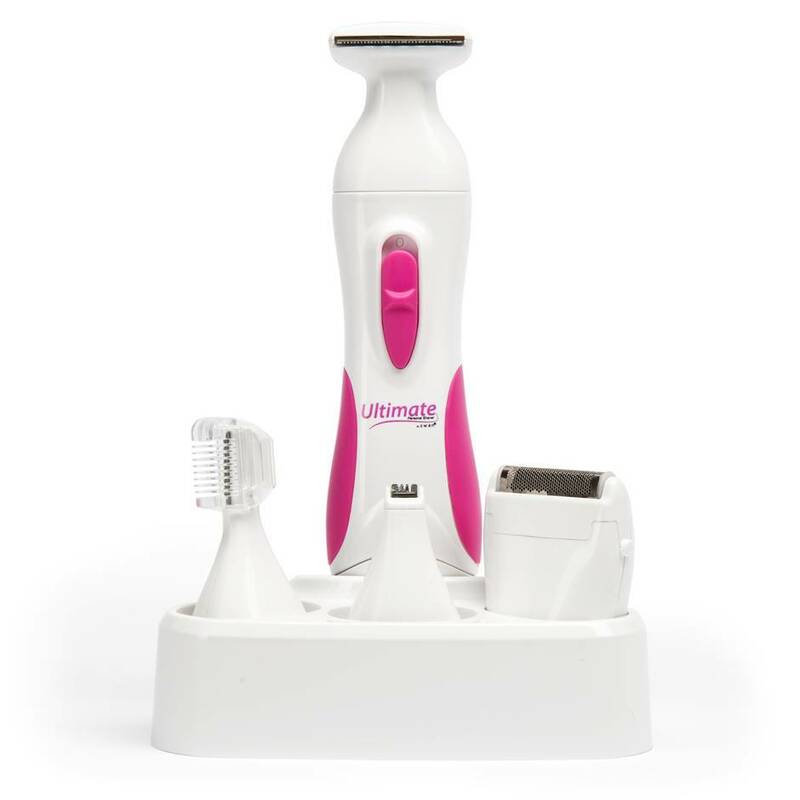 This shaving kit brings everything you need for smooth, hair-free skin. 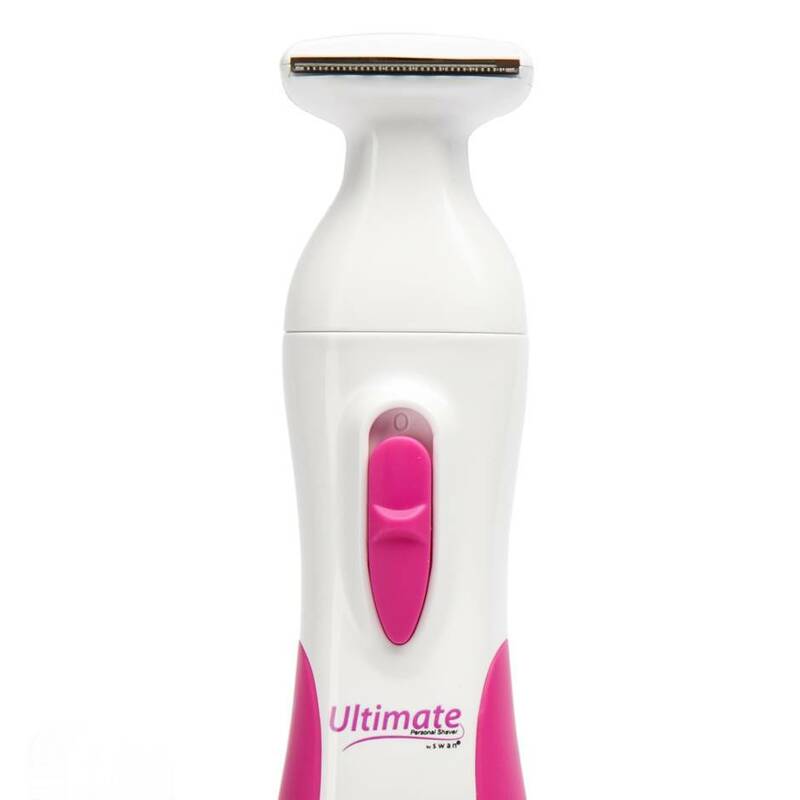 The Ultimate Personal Shaver by Swan can be used for maintaining your bikini line and keeping your legs and armpits velvet-soft all day long. Presented in a handy travel bag. I fell in love with this item when I saw it on the Lovehoney site, especially as I've always wanted a women's trimming set like this. Firstly, I love the pink and white theme, it's very feminine indeed and hubby knows it's my set. It stands really well on my bedside table as you get a cute little base with it that holds the main trimmer and all the separate heads. I like this because everything is to hand, whatever part needs trimming. The shaver itself comes with batteries which is always a bonus and a lovely pink drawstring travel bag, making it discreet wherever you take it. I found that I needed to put my own rechargeable AAA's in, x2 as the batteries that come with it only last two full body shaves. It shaved my armpits, legs, bikini line, facial parts and bottom if you so desire. I found this to be pretty acceptable before they ran out and with rechargeables, I ensure I always have a spare set charged and raring to go - just in case my shave takes longer or I want it to be extra smooth. The biggest shaving head, which is like a beard shaver, is obviously for thicker hair or if you're seriously due a trim. I found it not to be that effective, even when my hair down there was quite long, but I just use the other bits - they all do the job and well too. It's really nice that you get templates with it, so you can make different shapes in your pubic hair. I have tried the star, which was successful, but the other shapes don't stick on and stay in place too well. I decided to draw around the templates and stick them on with plastic book film covering - they did stick better, but I just trim up in my style now if I don't have the time. The templates are free, so can't complain. You can only shave with this item with talc. I use Medipure talc as it's got less harmful products in it, available from chemists and supermarkets. I'm not too bothered that it's not waterproof and you can't wet shave with it, overall it creates a lovely, attractive and smooth result. All the different accessories and the versatile stand. Templates and thick hair shaver didn't work too well for me. A worthwhile and good value women's essential. I bought this product after going through endless amounts of cheap razors to shave with and I was fed up of getting rashes and ingrown hairs on just about every part of my body. I was a bit sceptical at first because shaving has always been a chore for me and I'd spend at least an hour trying to go from looking like Chewbacca to C3PO! Once this product arrived, I was eager to see how big it was as it looked quite big in the picture, yet when I got it out of the box it was perfect! Decent size and very easy to handle and much more comfortable to hold than a plastic razor! The product is also great because it isnt limited to just your legs or bikini and the attachments make it easier for whichever part you need it for. 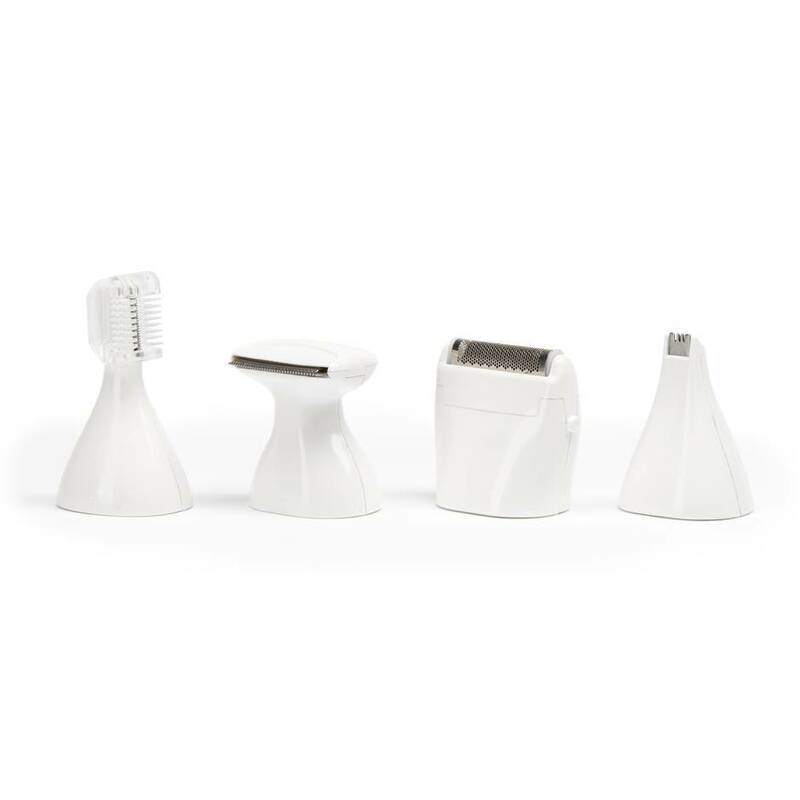 The shaver is very easy to use, and the attachments are securely and safely removed to be cleaned, and they come apart so you can clean the blades too. It is very efficient in shaving legs, underarms and bikini line, but it does take some practice for the ultimate smooth hairless feel. But I've used it twice and the difference is already noticeable, so don't give up after the first try! Great value for money and the stencils were a nice surprise! I didn't see them mentioned in the description, but they are also easy to use and my boyfriend loves it! Ultimately, everyone's different so test out each attachment and follow the easy instructions in the box and you will feel great in no time! Also make sure you get loads of batteries in! Depending on how long you use it for, the shaver can drain them quite quick with long shaving periods, but after shaving the once you may only need to touch up occasionally! Then the battery life is fantastic! Easy to use and clean. Great, close shave. Good value. Can be a little noisy at times. Batteries can run out easily. Fantastic product, well worth the money and no more spending on razors! This really is the ultimate personal shaver and I'm very happy to have it. The packaging is good. It comes nicely displayed in a cardboard box with pictures of all the attachments and a brief description of what each one is for, displayed on the outside. Inside, everything is laid out well, and you are left with the option of keeping it all together in the box, using the storage stand or using the storage bag, which both come with it. The instruction booklet is comprehensive and easy to follow, with plenty of descriptive images. It's quite bulky, but that's because everything is written in 8 different languages on each page. The attachments that come with the shaver unit are the main trimmer, the precision trimmer, the finishing head and the stencil trimmer. It also has an attachment for different lengths for the precision trimmer, a cleaning brush, assorted shaving stencils and batteries. I like to have everything off downstairs, so have not actually tried the stencils or the precision trimmer. However, if they're as good as the rest of the unit you should easily be able to achieve a perfect butterfly, musical note, arrow or any of the eleven designs that come with it! I have shaved for a great number of years, but always with a razor and shaving gel in the shower. This unit you use dry. I have also always had to shave in the direction of hair growth in intimate areas as going against, though it gets a closer shave, has always resulted in razor bumps and ingrown hairs! This unit you use the main trimmer first and go against the direction of hair growth, this did worry me initially, but I went with it. The unit is easy to manipulate wherever you want to get to, and leaves a nice close trim all over. You can tell when you're done by listening to the unit as you can clearly hear when the hair is short enough it no longer gets cut. At this point you move over to the finishing head, this is used with the skin pulled tight moving the unit in all directions. Again you can hear when you're done. The result is a very smooth, very close shave. It is recommended that you use body powder with this shaver, and though I didn't have any when I first received the unit, I now do use it and it does help to get that perfect finish. I have always used a post shaving product to prevent razor bumps and continue to do so, but so far despite this producing a much closer shave, I remain bump and ingrown hair free, which is excellent as this did not happen with a really close wet razor shave. The only thing I could not find any information on in the booklet is how long the blades will stay sharp for. Most electric razors seem to recommend replacing the blades once a year, but I'm not sure replacement blades can be bought for this shaver. If they could, this unit would be perfect. For anyone who doesn't want to wax those sensitive areas I would definitely recommend the Swan All-in-One Ultimate Personal Shaver. Closeness of shave and ease of use. Would be good if you could buy replacement blades for when they eventually blunt. An excellent, really close shaver that I would recommend.